Mapping The South - Group Exhibition Of Paintings is an event that took place between 28-Apr-2006 and 07-May-2006 in Hyderabad. This exhibition breaks the current trend of art-displays by  individual artists. The Vinayasa Art Gallery, Chennai, had put together a travel show showcasing the work of prominent artists from the southern states. The exhibition has been taken to Delhi, Mumbai and Chennai. And now, it has arrived in Hyderabad. 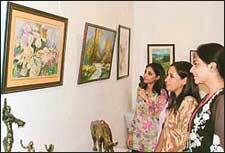 The show displays both realistic as well as abstract art. There are sculptures scooped out from metal, bronze and glass. Some of the well-known names out of the fifty participating artists are, Santhana Raj, Anthony Doss, Achutan, Vasudev, Karuna Karan, Laxman Gaud, Srinivas Reddy. Please contact 3091-3922, 2311-3308 for further details. Be the first to comment on Mapping The South - Group Exhibition Of Paintings! Just use the simple form below. fullhyd.com has 700,000+ monthly visits. Tell Hyderabad what you feel about Mapping The South - Group Exhibition Of Paintings!